Hi Everyone, some of you may be wondering, "what is Robin up to these days?, she sure as heck is not blogging about it?!" I am always busy and I realize my whole life is consumed with making things because it fulfills me in a positive way. Even rainy/stormy days are not boring for me because there is always something to do if you are a "Maker". I am sure there are a lot of you out there who are never idle just like me. I truly believe that creating and staying busy is one of the keys to longevity, I guess time will tell!! I apologize for not getting back to my blogging. I have actually been very busy with class samples for new and upcoming classes. I have 3 new classes "Next Steps in Free Motion Quilting", "Explore Thread Painting" (New Samples) and an upcoming "Angela Walters Rulers Class" (Samples under development). The backs of my thread painted projects are shown below, I love how they turned out! Samples for "Next Steps in Free Motion Quilting"
Want to take a class with me? Check out the schedule for locations and dates at the top of the teaching page. I would love to help you enhance your quilting and sewing experiences.... so join me as I share my knowledge with you. Stay tuned for the Angela Walters Rulers Class info, it will be posted very soon! New Teaching at a New Location! Yesterday I had the honour of visiting a new quilt/sewing/needlework shop (at least new to me). One of my local guild members recommended that I contact Stitch-It Central in London, Ontario about teaching and so I did and met with two lovely ladies Cindy and Maria yesterday. I have to say I am very impressed and of course I am going to tell you all about it. Who does not love another resource for our stitchery passions! Stitch-It Central was located in Ingersoll for several years and recently re-located a few KM east off of Highbury Avenue in London. They specialize in Cross Stitch, Knitting, Crochet, Quilting, Tatting and lots of notions, decorative thread, beads, online sales and more. It is a big store as boutique style stitchery stores go including a large retail space and a large classroom. They also stock over 3000 bolds of luscious quality quilting fabric and an extensive line of Superior Threads, including King Tut (my personal favourite for free motion and thread painting). They also are wonderful with customer service and I witnessed Maria and Cindy in action and have very positive online reviews. If you cannot make it to London? Purchase items from them online --***Enjoy Free ground shipping on orders of $150 or more before taxes within Canada*** Check out their website here . Getting back to my title, ​New Teaching at a New Location, yes I will be teaching at Stitch- It Central! I am calling it "new teaching" as the samples will be new and geared to this store and I am sure the experience of teaching there will be all new as well. I will show you my new samples as soon as they are ready on this blog. Hoping for the end of August, now I need to get to work! In the meantime, if any of my Southern Ontario friends from LaSalle, Windsor and Essex County (you know who you are) want to go on a shop hop this summer and meet me in London for a visit at Stitch-It Central? ​I am happy to do this and we can do lunch! On Saturday I was honoured to teach some members of the Erie Shores Quilters Guild in Kingsville. Check out their blog post about the class on Facebook here. Our subject of the day was Quilting With Rulers for Domestic Machines, you can check out my class description here or click on the "Teaching" tab above. ​This was one of many of my rulers classes and I still learned some new things along with my students. This is always wonderful! Learning and sharing together is the best. I discussed primarily the Westalee rulers and the Angela Walters rulers along with some helpful tips and design ideas. Believe me when I say these ladies were so positive, receptive to my ideas, talented and skilled. I thoroughly enjoyed sharing ideas with them. Thanks to all the ladies who participated. You can see this happy group above. ​Below I am sharing just some of the work they completed in the class. Thanks to the ladies of the Erie Shores Quilters' Guild for hosting and organizing this event! Also, Thank You to Hummingbird Sewing in Barrie, who allowed me to bring some notions and supplies from their store so that the ladies had some wonderful resources! If your guild or group, would like a domestic rulers class, I am ready for you. Just click on the teaching tab above. I'm off Saturday to Kingsville to teach my class "Quilting with Rulers for Domestic Sewing Machines" with the wonderful members of the Erie Shores Quilters Guild and just thought I would share an excellent resource with my readers. The resource I am speaking about is a fantastic book by Amanda Murphy called "Rulerwork Quilting Idea Book" I am excited about this book and recommending it because it contains 59 Outline Designs that can be done with rulers and then filled with Free Motion Quilting.. This book is both for the domestic and long arm quilter. I was reading it over and utilizing it to discuss ideas with my class and I think it's a great comprehensive book that everyone should have if they are serious about using rulers for quilting. I will certainly recommend it in all of my classes! ​See the contents of the book below to see what I am talking about. The pictures alone do not do this book justice, I ordered it from Amazon and believe me, I am not disappointed and I would recommend it to my students and anyone passionate about making their quilting precise and beautiful! As you can see below, this book is very affordable at $25.69, spiral bound and easy to refer to while you are working on your quilt. I am hoping to share some photos of my student work next week, check back to see what creative ideas they have, I am sure there will be an abundance of them! Have a lovely weekend and Happy Friday? I have developed a new class and it's shown on the "Teaching Page" of this website. I am so excited to be teaching Quilting with Rulers for Domestic Machines! "Quilting With Rulers for Domestic Sewing Machines This workshop is designed to teach you to understand how to work with the new and very popular rulers for domestic sewing machines including brands such as Westalee, Handiquilter, Bernina and more. You will be shown how to master setting up your sewing machine and ruler foot . Handouts and tips for success will be shared along with step by step instructions for each ruler, Demonstrations and practise time will be allowed for students to create additional patterns to make the most of using their rulers." In this class you will make individual blocks to practise with your rulers to be ready to try your hand at a sampler quilt. If your shop, guild or group is interested in this class, please have a look at my teaching page for more details. 'Thank You to these lovely ladies for allowing me to share pictures of their work with you and for attending my class. It was truly an honour to share my love of thread painting with you! I know it is somewhat hard to see but what I taught was my method of basic raw edge machine appliqué and then a technique to thread paint using a sewing machine and needle over the appliqué to make the project textured, shaded and dimensional. Do you have a guild or group who wants to learn how to thread paint? ​Click on the "More" tab above and then "Teaching" or click here to see how I can teach with your group. I love this technique so much that I would be happy to teach it to all quilters and those passionate about needle work. I am off to The Region of York Quilters' Guild Meeting this evening to show my "Quilters Journey" and Trunk Show and looking forward to it. From time to time I get students who have taken a class or two from me, send pictures of their work. Most recently Nora has sent me some pics of her thread painting and free motion work. I thought I would share this with me blog readers. We all need inspiration! The finished product- simply fantastic! .... and thats not all ..... Nora has also sent me the quilting and thread painting work she had done from the first class she took with me, see photos below of her placemats. This class was a class project to practise free motion quilting and she added the flowers as her own creative addition with thread paint. The class project suggested some hexies on the side but Nora wanted to try her hand at adding a thread painted design. Excellent work by Nora, she is very adventurous and clearly creative! Thanks Nora for sharing, you are getting more skilled by the day! Be adventurous with your sewing and try something new today! Free Classes On the Internet! There are many free quilting classes at craftsy.com! Click on the image above to see more! Everyone knows by know that I am a Craftsy Affiliate which means I recommend Craftsy as an online resource for sewing and quilting classes and I would not do this unless I believe in them!! Every class I have taken has been extremely beneficial to me in improving my skill set as a quilter, sewist, baker and chef (lol!). The classes are detailed, informative and fun! ​As one of my sponsors Craftsy.com does provide me with a small monetary gain by recommending them to you (the $value products and classes, not the free ones!) and that helps me in keeping my website alive and flourishing. Today, I'm just letting you know that there are many classes that are free! I encourage you to have a look at www.craftsy.com and Watch FREE online DIY classes at Craftsy - lifetime access! I have been really busy these days teaching and showing my quilts in both Windsor and Barrie, Ontario. I'm sorry, I did not get photos from the trunk show and the class in Barrie, however I will show you others that I have below. Free Motion Quilting and Thread Painting (beginner and advanced). So much fun, a great way to use up the beautiful thread you have been collecting, a fantastic way to embellish your quilts easily, empowering because you are painting with your sewing machine needle as the paint brush, creative, allowing you can make one of a kind art work, easy and a great skill to learn!! This past Saturday, I taught a free motion quilting class at Hummingbird Sewing in Barrie and yesterday one of my students sent this picture of her "practise" of the free motion quilting. I believe "Natural Talent" is the phrase that comes to mind. Nicole used a continuous machine quilting template for the centre and June Tailor Grid Marker to quilt the background. Doesn't the pattern in the background make the heart stand out? It's fantastic! I have talked about this grid marker before in this blog and it is wonderful. You can make 60 degree diamonds and 40 degree square patterns and the seed stitch along with lines in all directions without moving the template and no measuring. Congratulations Nicole on practising as recommended in the class and mastering what you have learned. Also, thanks so much for sharing your work! 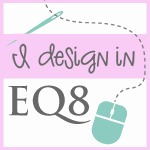 ​​Hi I'm Robin and I am a professional long arm quilter, pattern designer and teacher. I am passionate about all thin​gs quilty! This blog contains affiliate links. This means that we endorse products. We do receive rewards for these endorsements and this helps to keep this site alive and well. We support products which we believe are the best quality and to inspire your creativity!